Description: Incredible puzzle! It is more fascinating than 100 floors and 100 doors. Little monsters have captured your home. Use all your skills to pass through all levels of this addictive puzzle. Click and send each monster back home through the portal. Protect your home. One time, with a time violation, a small portal was opened in one of the apartments. From this portal jumped out small funny monsters and began to house in the apartment and restore order. You have to collect all of the monsters and return them back to the portal. A fascinating game that will make you break your head. Go through each level of 150 and send all the annoying monsters home. In the game itself, you need to combine, moving, on the playing field of pocket monsters of the same kind, so that they disappear into their portal holding each other. The main condition is not to leave any monsters on the playing field. 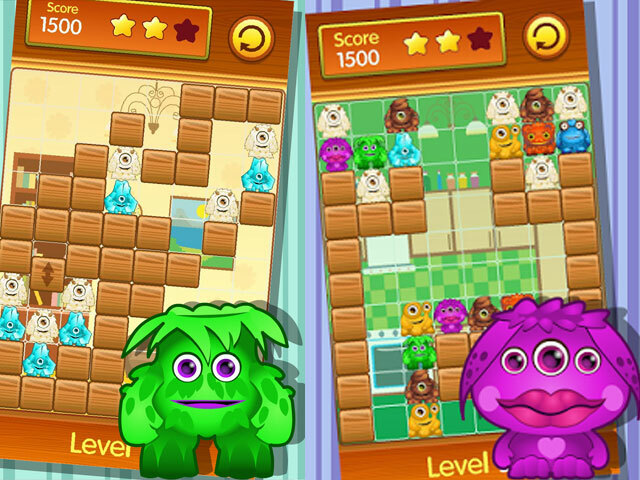 - Enjoy colorful graphics and great animation, - eight cool, unique monsters, - Manage characters and go through all 150 levels, - make up combinations and clean each room, - Earn stars after each level, - Play completely free; The monster in my house is one of the coolest puzzles that will make you strain your brain and pass each level with pleasure.